This game, created by the Canadian Labour Congress, is a way to start a conversation about the challenges women face in balancing work and family life – from finding child care to securing safe housing, to dealing with a stressful workplace. Follow this link to play the game, then check out the sections on the left to learn more about the challenges women face with regard to work/life balance. e-flux is pleased to launch Time/Bank: a platform initiated by Julieta Aranda & Anton Vidokle, where groups and individuals can pool and trade time and skills, bypassing money as a measure of value. Time/Bank is based on the premise that everyone in the field of culture has something to contribute and that it is possible to develop and sustain an alternative economy by connection existing needs with unacknowledged resources. The origins of time-based currency can be traced both to the American anarchist Josiah Warren, who ran the Cincinnati Time Store from 1827 until 1830, and to the British industrialist and philanthropist Robert Owen, who founded the utopian “New Harmony” community which banned money. The first successful contemporary time bank was started in 1991 by Paul Glover in Ithaca, New York. Following his idea, people began to exchange time, which led to the creation of a time-based currency—the “Ithaca Hours,” which even local businesses began to accept, and which still flourishes. Time banking and service exchange have since developed into a full-fledged movement, usually centered around local communities. 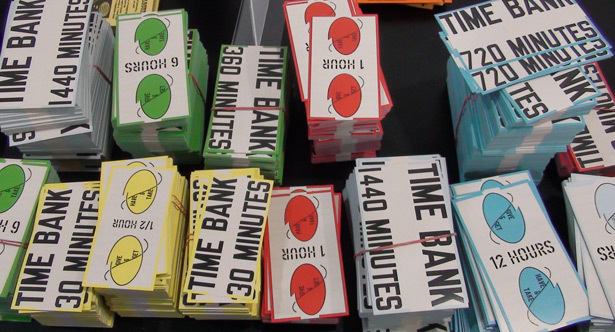 Time/Bank at e-flux is modeled on existing time banks. Every Time/Bank transaction will allow individuals to request, offer, and pay for services in “Hour Notes.” When a task is performed, the credit hours earned may be saved and used at a later date, given to another person, or contributed towards developing larger communal projects. For example, if you happen to be in Beijing or Hamburg and need someone to help you shop for materials or translate a press release, you would be able to draw on resources from Time/Bank without exchanging any money. Through Time/Bank, we hope to create an immaterial currency and a parallel micro-economy for the cultural community, one that is not geographically bound, and that will create a sense of worth for many of the exchanges that already take place within the art field—particularly those that do not produce commodities and often escape the structures that validate only certain forms of exchange as significant or profitable. To open a time bank account, please register at www.e-flux.com/timebank/user/register. A short existential game about alienation and refusal of labour. Or, if you prefer, a playable music video. Created by Molleindustria, an entity that aims to reappropriate video games as a popular form of mass communication. Their objective is to investigate the persuasive potentials of the medium by subverting mainstream video gaming clichè (and possibly have fun in the process). Oh really? Well, that’s quite an interesting point from which to commence a debate on this subject. Click here to read Professor Robert J. Gordon’s defence of this motion and John de Graaf’s rebuttal. John O’Sullivan moderates and citizens of the interwebs are welcome to contribute their comments, as well. What is the good of work? How and why did the sixties and seventies vision of a future defined by leisure change into the reality of an exhausting life of increasingly purposeless work? What are the implications of the shift from a Fordist model of production to a post-Fordist one? Why is work valorized in contemporary society? What happened to the radical potential of labor? What can we learn by examining its various critiques, from those expressed in the Middle Ages and up through the strategies employed by the Situationists and others? Unemployment is becoming a reality for an increasing number of people. How might we think of unemployment as an artistic and philosophical category? These questions will be examined during four events at the Goethe-Institut Wyoming Building in the East Village. Each event will involve two guests–one artist and one cultural producer of another kind. 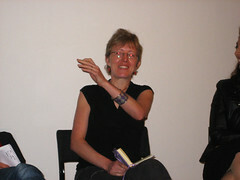 Marysia Lewandowska and Peter Fleming will be the guests at the first event on October 17, 2009. Marysia Lewandowska is a Polish-born, London-based artist and a Professor at Konstfack Stockholm. Her past and current projects reflect the ways in which institutions determine the exchange of values between art and its publics. She is currently developing Women’s Audio Archive as part of her residency at the Center for Curatorial Studies, Bard College (CCS Bard) in Annandale-on-Hudson, NY. Peter Fleming is professor of Work, Organization and Society at the Queen Mary College (University of London). One of his areas of research concerns the cultural politics of work organizations and the modes of ideological control that operate to enlist the participation of labor. Thank you to Adam Proctor and Sean James Fraser, as well as the other staff members of Peacock Visual Arts for facilitating and documenting our roundtable discussion on June 13. The following video offers a 14 minute collection of highlights from our hour-long conversation. Feel free to keep the conversation going by posting comments! 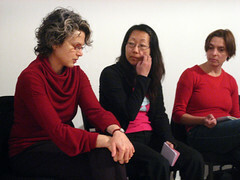 No Time To Lose – Artist’s Talk from 3sixty-tv on Vimeo. The next day, from 12:30 – 1:30 p.m. , we held an informal lunch time discussion to not only discuss the motivation of the exhibition and each featured artwork, but to discuss the wider phenomenon of overwork… what causes it and why society can’t seem to say “no”. 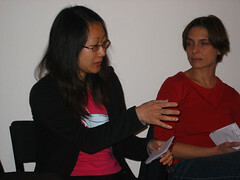 As shown in the photos below, the conversation was video recorded. Adam and Sean will be editing it down to a something akin to an exhibition “trailer”. At a later date, we’ll excerpt from it for our forthcoming publication. Let’s keep the conversation going here!! If you have questions or ideas, please share them with us!